A pair (two) of cut vinyl visor/bike stickers in either white or black with an option for mixing curved and straight in one pack. Height of the text is 8mm (Facebook 'F' 10mm), length is 183mm. 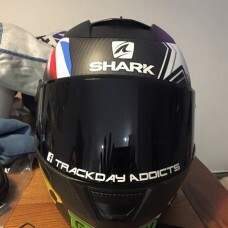 The curved decal is produced with a curve to flow with the lower visor shape, straight option is, well, straight!